EA and DICE are making it official now; the Open Beta for Star Wars Battlefront will start on October 8, 2015 to October 12, 2015 and it will available for PC, Xbox One, and PlayStation 4. No registration required to access the beta. But The Star Wars Battlefront Companion is available during the beta to all players with an EA Account at www.StarWarsBattlefront.com. The download size will be 7GB for consoles and 11GB for PC. Console gamers can get the beta via the PSN store or Xbox Marketplace. PC gamers can pre-download the beta on Origin am PT/10am CET on Wednesday, October 7th 2015 at https://www.origin.com/store/free-games/demos-betas. While you’ll only be able to rank up to level five, your progress and stats will not carry over to the full game on November 17, 2015. 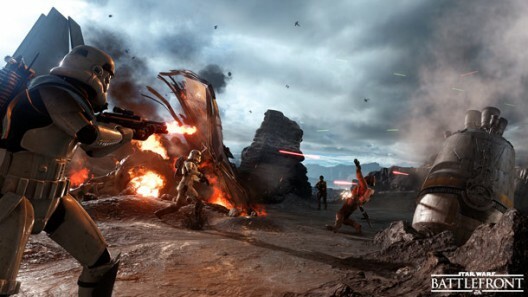 At least we’ll get a small taste of Star Wars Battlefront before its release. Still no word yet on that official PC system requirements DICE eh? My body is ready, not sure about my battle station lol. CPU: Quad Core CPU eg. Intel Core i5-2300 @ 2.8GHz or AMD Phenom II x4 955 @3.2GHz or AMD FX-8350 @ 4.0GHz. Video Card: Nvidia GEFORCE GTX 680 or AMD Radeon HD 7970 with 2GB of Video Memory. Walker Assault on Hoth: Fight in epic 40-player battles as a Rebel to destroy the Empire’s onslaught of AT-AT’s by calling in Y-wing bombers. Or, side with the Empire and protect your walkers while utilizing their mighty weaponry to crush the Rebel objective. Survival Mission on Tatooine: Play alone or with a friend via co-op or split-screen as you battle to hold off waves of Imperial forces including AT-ST’s, TIE fighters, elite stormtroopers and more. Only level 5 lol and no stat carry over, time to do stupid things in the beta. in b4 the tryhards moan about there K/D ratio. 20 VS 20 on Holth dream come true. The fire starts to burn!